This Magazine → New issue on newsstands now! 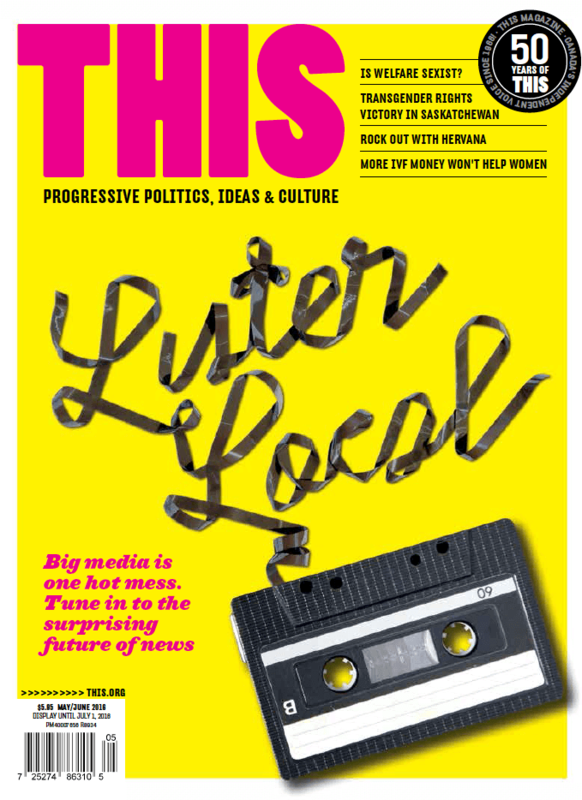 In this issue’s cover story, Doug Horner examines the defiant success of community radio, arguing that it provides a resilient blueprint for successful, worth-tuning-in-to media in the Digital Age. Could community radio be the surprising winner when it comes to the future of news? Read Doug’s piece to let us know what you think! Also in this issue: Amanda Van Slyke asks “Is welfare sexist?” in her new essay; Nadia Alam contemplates what it’s like to run away from home; Lisa Whittington-Hill hangs out with the Hervana; Saskatchewan makes huge strides forward in transgender rights; and more! Want This Magazine delivered right to your door? Visit this.org/subscribe today. You can get one year (six great issues!) for only $27.99 or two years for $42.99 (an even better deal)! Also, head on over here to meet our new art director Valerie Thai.